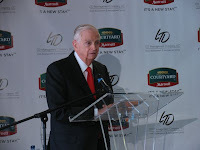 Bill Marriott, chairman and CEO of Marriott International, praised the use of space at the new Courtyard Newport News (Va.) Airport hotel, which hosted the brand’s 25th anniversary celebration. 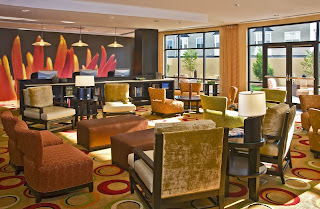 The hotel showcases the brand's new lobby and exterior design and refreshed guestroom design. Marriott said he never imagined when the first Courtyard opened that there would be 800 hotels to follow. 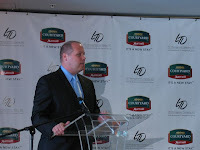 Research found that guests would pay a $10-$15 premium for hotels with the new lobby, said Brian King, VP, global brand manager for Courtyard by Marriott. “We've seen a 27 percent lift in intent to recommend and intent to return scores from our customers." A new interior design package for guestrooms has a global inspiration that aims to be modern, warm and approachable. Tubs have been taken out of plans for most bathrooms in favor of glass showers. Cost per key will remain about $87,000. Dilip Desai, senior managing partner for LTD Management Co., which owns and operates the Newport News property, said during his seven years on the Courtyard FAC, Marriott and the owners give and take. “That’s what I like about Marriott. We are the owners and they are listening to us,” he said. 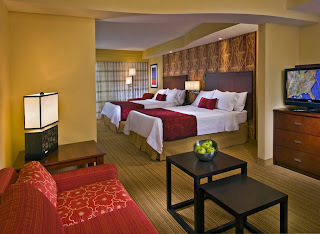 Marriott International will open 30,000 rooms this year and has another 30,000 in the pipeline for 2009. The majority of them already are financed, Marriott said. “We’re good through ’09, and hopefully things [with the economy] will start to turn around by then,” he said. 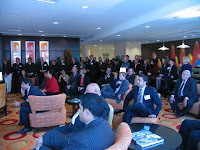 For a Marriott video of the anniversary event, click here. Recession and inflation are two factors that have taken the whole world by storm. The slump in the economies has led to a major downfall in the travel and tourism sector also. Cost cutting and rightsizing, as they call it have hit most of the countries of the world. Under such circumstances it is only natural that the travel industry has seen a steep fall in the graph. Tourism has also declined in the countries like India that is one of the favorite destinations for the leisure traveler. Thankfully, since the country is now a growing lucrative market with a bulk of foreign investment, the number of business travelers has not witnessed a cut down. The business hotels situated in the major cities of India also have the facilities and ambience of luxury hotels, as these hotels most of the time cater to the overseas business travelers. The business hotels in Hyderabad and the hotels in Hyderabad along with the four metros can be counted in this group. Earlier amongst the metros, Delhi and Mumbai enjoyed the highest number of business travelers. However, times have changed now and Chennai and Kolkata are also fast becoming business hubs. The rising number of business hotels in Chennai and Kolkata is testimonial of this fact.